Oughterard Boxing goes from strength to strength and breaks more records with the club having it’s first ever Boy 1 champion to win an All Ireland title. Hard to believe that with all the talented boxers that have passed through the club that this title eluded so many. Considering Thomas Lee won an impressive 9 titles and Marvin Lee won 5 and with many more aspiring boxers that this title was still left to be won. 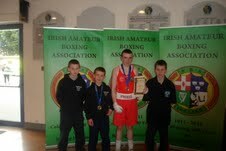 On Friday the 13th of April Mathew Tierney of Portacarron won at the boy 1 39 kg category. Only moments before this Cillian Tierney of Glann was unlucky not to have had the honor at boy 1 31kg. The club also won an impressive third title when Kieran Molloy of Raha won his bout at boy 3 52kg adding to his brothers title Colm whom won at youth 1 50 kg earlier in the year. Kieran was impressive all the way stopping all his opponenents in the run up to the final. This page was added on 18/04/2012.